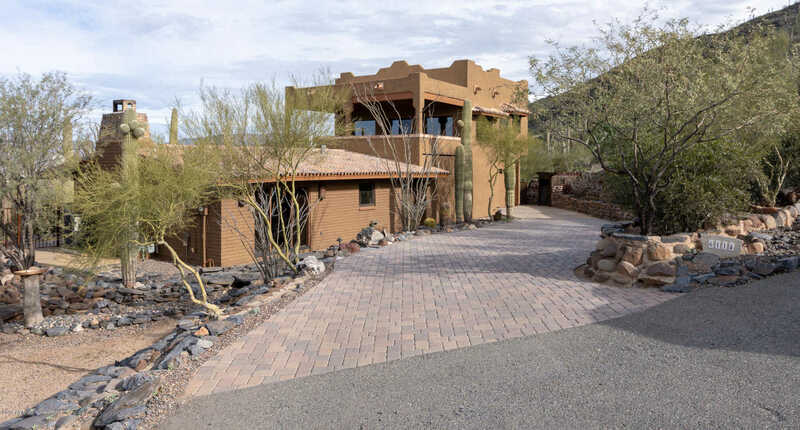 Situated at the top of a street on the iconic landmark of Black Mountain, this meticulous hillside home has unobstructed mountain views and endless city lights from Phoenix and the town of cave creek below. Powerlines have been placed underground. A cobblestone drive and amazing rock work greets you upon arrival. With over 2600 square feet of living space, this 3 bedroom, 3 bath home can easily be converted into 4 bedrooms, 3 baths with 2 of the bedrooms being en-suite. You will have no lack of storage space with the garage measuring 32’x24’x12′ and an oversized 16’x10′ garage door. In addition, you have a detached 12’x12′ workshop and storage shed. One of the best features is the upstairs covered 25’x15′ patio where you can take in the views and serenity of this tranquil setting. Approximate size: 27960.00 sq. ft. Please, send me more information on this property: MLS# 5869334 – $650,000 – 6114 E Carriage Drive, Cave Creek, AZ 85331. I would like to schedule a private showing for this property: MLS# 5869334 – $650,000 – 6114 E Carriage Drive, Cave Creek, AZ 85331.